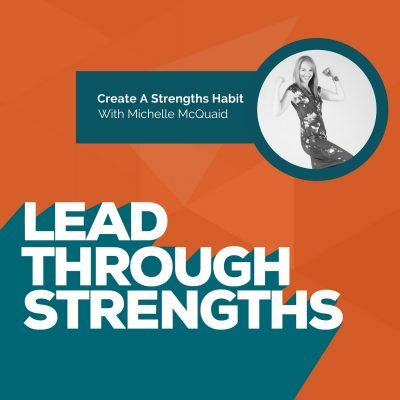 Today’s episode features Michelle McQuaid, the author of “Your Strengths Blueprint: How to be Engaged, Energized, and Happy at Work.” During this engaging interview, Lisa Cummings chats with Michelle about her personal experience using her unique Strengths. Michelle shares practical examples about how she made huge changes not only at work, but also throughout every aspect of her life. Today, Michelle is flourishing and providing guidance to others via her books, coaching, training, and through her annual Strengths Challenge. These are usually in September each year, and we hope you’ll join the next one! If you are interested in adding new tools to your Strengths toolbox, then this is the episode for you! Listen for several tips and tools to improve your work and home life, and perhaps learn a Dr. Seuss rhyme along the way. Michelle was in an executive role. She had achieved her career goals, and everything looked great on paper. However, she had a nagging, unhappy feeling about work, and she found herself dragging her feet into work each day. One day, she was watching a popular tv show, and saw a segment on “positive psychology.” This segment would forever change her life. Michelle found one of Martin Seligman’s books. He’s the guru in the field of positive psychology. As she read (and later studied directly with Seligman), she realized that our goal should be to bring out the best in ourselves and others more consistently. The more we use our strengths in our jobs, the more engaging, energizing, and fulfilling our lives can be. Read one new thing about positive psychology each day for 10 minutes. Michelle found that this exercise had a positive ripple effect throughout the rest of her day. It shifted how she felt at work. Each Friday, she emailed her boss 3 things she had learned through her reading that week. Later, she found out that he had been forwarding her emails to other people. At her 9 month review, he noted that the company hadn’t been using her strengths as effectively as they could be, and asked if she’d like to teach these ideas to others. This gave her a chance to put her strengths to work every day. The moments that people were able to actually see her strengths led to new career opportunities. In essence, Michelle ended up crafting her new career path. VIA is a a system that “diagnoses” the best in people. It’s a list of 24 character strengths that are consistent across cultures and history. The goal is to focus on the top 5 character strengths that light you up the most. Harness the natural part in your brain to create new habits (good or bad). Make sure you have some cue to work on that strength each day. For example, putting a book on your keyboard for the next day, or listen to a recording about this strength each day on your way to work. Reward yourself each time you work on this new habit; it needs to be something you really want. For example, have a cup of coffee after your 10 minutes are up. Check out the resources below, because Michelle offers a free e-book on her website to help you be in your zone of greatness. It’s an excellent aide to improving yourself and creating new habits. It’s a strengths-based approach to change, where you build on things that are working well. There is a positive effect on the company and the team. Spend 80% of your time on your strengths, and 20% on our weaknesses. You want commitment not compliance. Be realistic about how to get the best return on investment. Michelle’s Article with Shane Lopez. Take the free Character Survey from VIA Institute on Character. Michelle’s eBook resource: Can You Do More of What You Do Best? Learn more and register for the Annual Strengths Challenge, which is September 6 – 12, 2016. Lisa Cummings: [00:00:06] You’re listening to Lead Through Strengths, where you’ll learn to apply your greatest strengths at work. I’m your host Lisa Cummings, and I’ve got to tell you, whether you’re leading a team or leading yourself, it’s hard to find something more energizing and productive than using your natural talents every day at work. [00:00:21] And, today, you will hear from the author of Your Strengths Blueprint: How to be Engaged, Energized and Happy at Work. Hey, that’s something everyone I’ve met would love to feel about their workplaces. Your guest today has a Master’s Degree in Applied Positive Psychology and she’s working on her Ph.D. looking at how Appreciative Inquiry – if you’ve never heard of that, we might touch on that – how it can allow an entire workplace to flourish. [00:00:49] She also got to study with Martin Seligman himself. And for those of you who don’t know, he is like the godfather of Positive Psychology, so that is really cool experience. And then to balance out the academic side, she also was a senior leader in large companies so she gets what you guys are going through from the practical side as well. And you’ll love listening to her because she’s Australian, and Aussies are the best things ever, so maybe we’ll drop some in today. And turns your workplace into a strengths alliance. Michelle McQuaid, positivity virtuoso. Let’s go! Lisa Cummings: [00:02:04] Well, you really got me inspired with your Dr. Seuss so I can’t resist the urge to rhyme. Lisa Cummings: [00:02:13] Thank you. Now, I have read so much of your work on Strengths in Action and I love looking at your YouTube channel on this kind of stuff. I see so much in there on the theme of thriving and flourishing and even feeling courageous. So I’d love to hear, to kick off, what’s your favorite experience in applying those elements? [00:03:01] And this went on for a little while and I really think, more out of desperation than anything, I started trying to go, “Oh, what’s missing? What now have I kind of overlooked in getting here?” And I was watching Jon Stewart one night on our couch, eating dinner out of a takeaway container as you do, and this professor came on from Harvard talking about his new book called Happiness, about the fact that his course have become the most popular course on campus at Harvard, which was the first time ever something was more popular than economics, and he was teaching this field of Positive Psychology, this science of happiness and human flourishing. [00:03:35] And I think I sat, literally, quite bolt upright that night on the couch, and went, “Oh, my God. There’s actually a science to how we bring out the best in ourselves and others more consistently.” So I rushed out to Barnes & Nobles the next morning; I grabbed this book and devoured it. That led me to the work of Professor Martin Seligman who, as you mentioned, is seen by many as kind of the godfather of Positive Psychology, and suddenly this whole field opened up. [00:03:59] And one of the first things that I came across, of course, in that work was the idea that the more we use our strengths, the things we’re good at and enjoy doing in our jobs, then often the more engaging and energizing, fulfilling life could be. So I started with the free Values In Action, the VIA survey, and the first thing that came out in that time when I took it was the number one strength was curiosity. And I realized that I had reached a point of technical development in my career but wasn’t really learning new things anymore, and I think that was part of the flatness that I was feeling. It just perhaps wasn’t the same challenge I had experienced in the year sort of leading up to that point, but I didn’t know what else I wanted to get curious about. [00:04:41] And so I decided, mostly as a sanity-saver to stop dragging my feet every day that I’d start each morning with a little 10-minute curiosity habit and I was going to wait one new thing about this field of Positive Psychology and see what else I could figure out from it. And in no time at all I started finding myself looking forward to getting into work, so I could have this 10-minute reading and started to notice that it created this kind of ripple through the rest of my day, so I started to think about, “How could I apply these ideas elsewhere?” and really shifted for me individually how I was feeling about my job. [00:05:52] So my second bigger hire in that moment of using my Strengths more was not just that it was good for me but it gave other people a chance to see what I look like at my best, and to think about ways to leverage that in our organization, and that was really the turning point for me into a whole new beautiful part of my career and my life as a result of just playing with my Strengths for a little moment each day. Michelle McQuaid: [00:06:53] Yeah, I think I definitely, like most of us in those moments, have had a, “I’m in the wrong job. I’m working for the wrong company. I’m working for the wrong boss.” Probably, fortunately for me, though I didn’t feel that was at the time, my options were pretty limited because I was being sponsored as an Australian to work in New York by the company, and so it wasn’t as easy for me to just quit my job. And I was the breadwinner in our family at that time, we had moved our whole lives to a different country; I kind of was stuck for at least the next 18 months. [00:07:19] And so, rather than just up and quitting, which I think is definitely something I would’ve done if I was in Australia and I had easy options, I think I would’ve just hit the job market. And, of course, what would’ve happened through that is I would’ve found myself in exactly the same situation probably, just in a different job, because I didn’t really understand what it was I was trying to change. But because I was stuck I had to look for a way to make it better. [00:07:41] This was true for me at the time, and certainly now I teach this work in lots of organizations. The most common reason we find that people don’t start using their Strengths more at work isn’t that they’re not convinced by the research or the benefits of it, it’s not that they don’t want to, that we’re all curious about what we do best and we all like the idea of doing more of that. But the number one reason is that we just don’t have time. Even though most of us believe that our careers would be most improved by using our Strengths. [laughs] We’re just kind of crazy, right? We know we should, but we just can’t find the time. [00:08:14] So that was, I think, a really important step for me, was trying to shrink the change down, so that it could be busy proof. And, again, it wasn’t that I had any particular wisdom around that at the time, although I could find plenty of research to back it up now, it was desperation. It was just, “I’m busy. I’ve got so much on. I’ve got a young family, big job, I just need to do something.” And if I could just find 10 or 11 minutes today, became excuse proof, no matter how busy my day was, I could find that time somewhere. And then once I started, it became the best part of my day, so it was so easy to keep going back and doing it. Lisa Cummings: [00:0848] :Yeah, you found the sparks of energy. And, oh, that piece that you said about how you would’ve quit and you would’ve carried that stuff forward with you. I know I’ve done that in several roles. I’ve heard so many stories like that. You carry your baggage in your mind with you until you have the wake-up call, and it was your moment of stress and feeling like you’re a little bit stuck that created this strategy, so it’s beautiful. [00:09:12] Now you get to help people with these bite-size ways to approach it. And I think a lot of people feel trapped. They tell me they feel trapped by their big kid bills. They tell me they feel trapped because they have mouths to feed and they feel responsible for their families, and so even though they’re not being sponsored in another country, and really under that kind of pressure, they still are very afraid of bold career changes and they feel like they’re floundering. You call that functioning instead of flourishing, right? Michelle McQuaid: [00:09:38] Yeah, absolutely. And even flailing. When we get right down it, if you think about it as that kind of continuum at the bottom end, we flail which is where we’re really hitting depression. At the top end we flourish but in the middle most of us are spending our time, and we study after study with this, we describe ourselves as functioning. We’re getting by, life’s okay but perhaps it feels a bit grey, it feels a bit dull, feels a bit like we’re moving through the fog, and there aren’t that many bright spots moment in it. And when we do strike a real challenge we lack some of the resources to be able to navigate those moments well which can risk us sliding back towards flailing. Lisa Cummings: [00:10:41] No kidding. When you finally discover it and you think, “Oh, my gosh. I’ve just assumed that mantra that people say, ‘Oh, work is work. That’s why they don’t call it play. It must be an awful kind of experience.’” Why do we buy into that? And then I’m so happy to hear your micro strategies because I tell people all the time, “Get three more minutes. Three more minutes of what you want more of, and three fewer minutes of what you want less of.” Everyone can find that time, and it starts to compound and feel very different. You look up in three months or six months and, hey, you’re not dragging your feet any longer. Things look really different. [00:11:45] And so my boss opened up an opportunity for me to move out of branding and marketing and into our HR team, and then they had set up a role for me to be like an Internal Positive Psychology expert. And then as I was ready to go and try that in more workplaces with their blessing, I let this to one of my clients today, I still do work with them, and got to do it with other people. But it was that moment by moment along the journey. As people saw what I look like when I was truly using my Strengths, when I’m really up, when I’m engaged and energized and confident and at my most effective, then I found that the career opportunities started bit by bit clicking into place for me in terms of how I would use that. Lisa Cummings: [00:12:25] This story is so good and the idea. You’re like a poster child for job crafting or job shaping, and I’m talking to people all the time about, “Decide what you want to be known for. If you created your personal brand for the things that you love then working on your strengths zone what would they be?” And when you start volunteering for that kind of thing or, even in your case, sending emails about things you’ve learned, it created this whole career path for you that you wouldn’t have known about. [00:12:51] Well, I want to get to VIA a little bit because you mentioned that at the very beginning and I suspect a lot of my listeners haven’t heard of it. They certainly hear me talk about StrengthsFinder. For those listening, VIA stands for Values In Action. And I know my top five there. They’re Creativity, Humor, Curiosity, like yours, Hope and Zest. And so I know you’re way more familiar with this tool than I am, so, Michelle, maybe you can tell everyone a little bit more about VIA and then we’ll go from there. Michelle McQuaid: [00:13:21] Fantastic. So, Martin Seligman, when he was starting to found this field of Positive Psychology, realized that if we were going to help grow the best in people we needed to be able to diagnose that. For decades psychologists have relied on what they called the Diagnostic Statistics Menu, or DSM, to diagnose all the things that aren’t working with us. But there was no way to diagnose what did work for people and how you would build on it. [00:13:47] So, with the help of 55 social scientists around the world, and the late Professor Chris Peterson leading the charge, they scoured the world over three years for all the best examples of human life, and they looked through philosophy, history, religion, modern culture, they looked at Pokemon characters and the like, and they came up with this list of 24 character strengths that they found were consistent across time, across cultures where you could find paragons, people who really embodied those strengths. You could see them lacking in people as well. We could find ways to build them where people wanted more of them and, most importantly, ways to measure them. [00:14:23] And so this list of 24 character strengths includes things as you were touching on. Other ones are kindness, love, gratitude, I think you mentioned hope, perseverance, prudence which is all that setting a plan and sticking to it, all these beautiful examples of what human life is at its best. So the survey you can take at VIACharacter.org, it takes about 10 minutes. It’s free. And what it will identify is your character strengths listed in order from number one, so your highest strength, to number 24, and we talk about that as your lesser strength rather than your weakness, because in and of itself it’s still a good thing, it’s just you have less capacity in that right now. [00:15:01] And we tend to, the particular you’re listing, off get people to focus on their top five or six character strengths because these will feel like the strengths that are most authentic to you and that light you up the most. But we would also say, you know, while the strengths exists within you, they represent part of the way your brain is wired to perform at its best, they are also shaped by the situations that you find yourself in. And so we encourage people to re-take the survey on an annual basis, at least, so that you can see how things might be moving around when you change jobs, when you have things at home that are shifting around for you a bit, and you will find some of those strengths move around. [00:15:39] And so we often look at sort of number 6 to 20 and call these your middle strengths that once you’ve got capacity in, but unless the situation really calls on them you won’t necessarily be drawing on those as frequently as the ones that are the top. And then your lesser strengths, number 20 to 24, you’re probably really not using much at all. And I often find when you get people to take the survey the first thing they do is go to the bottom and look at number 24. Lisa Cummings: [00:16:03] Of course they do. [00:16:36] So the first time I took it, love was strength number 20, and I looked at that back in 2008 and went, “Hmm, I kind of like more of that for the kind of work I want to do and the life I want to live.” And so I had intentionally started investing at least in one act of love for myself or somebody else each day. And when I retook the survey earlier this year, some nearly eight years later, love had come up as strength number three. So it did move over time but it did take that consistent practice, that wiring of the neural pathways in my brain to really make love more of a focus in my life as well. Lisa Cummings: [00:17:08] Wow. I want to talk about these kind of practices because that just sounds like a beautiful thing to be able to look at one that you desire more of, for whatever reason, and then tie that into, I’ve seen you talk about those strengths-building habit, I think it was like an 11-minute strengths-building habit that seemed really practical. It seems like these would tie together. I may be making things up in what I’m tying together in your work. But if you could talk a little bit about what are these examples? Because people make this out to be really hard and big, and it sounds like you’re making it out to be very doable and reachable. [00:18:28] And then, every now and then, someone will go, “No, I’ve got somebody else’s results entirely. I don’t know who this person is.” And if people do that, I always say, “Well, just share it with some friends and colleagues who know you well and say, ‘I took this crazy Strengths survey. These were my results. What do you think?’” And sometimes we’re blind to what we do best. We just take it for granted that everybody does those things, which of course is not the case. And sometimes it’s that, you know, we’ve perhaps interpreted questions as we did the survey in a certain way and so it’s ranked something higher than you. [00:18:55] And I love Professor Chris Peterson used to always tell us, “It’s a tool. It’s not a magic oracle. It doesn’t know something about you, that you don’t already know about yourself.” So I think the first step is figuring out if you’re going to create a little daily strengths habit, are you trying to do something just more consistently like I was with my curiosity habit? Are you trying to move something up like I did later with my love habit? [00:19:16] So, the first step is getting clear on which strength that you’re really trying to build. The second then is harnessing the natural neurological pattern your brain has to create habits. So what we’ve discovered is that every habit you have, good or bad, actually runs in a very simple formula where there’s some kind of cue that triggers the habit off. It could be a time of day, it could be embedding your habit in your environment. [00:19:39] So when I was doing my curiosity one, I used to leave my book or whatever article I was reading across my keyboard the night before I left work. So, in order to turn my computer on in the morning, I had to pick it up, and then holding the book in my hand, like putting it down would’ve felt like the most self-defeating thing in the world. And we can prime our brains with when-then statements. So my way to work is I always used to say, “When I get to work then I’ll spend 10 minutes learning something new.” So we need a cue to trigger up the behavior, there’s then the routine itself we perform which, in this case, you just want to work on whatever Strengths you’ve chosen and trying it in that state of flow where you’re just feeling like you’re in the zone, you’re one with the music. [00:20:15] If you can do it for longer than 10 minutes, by all means do so, but don’t not do it because you’re too busy. Remember my 10 minutes was just a way to busy-proof, making sure this really happened for me. So, for my curiosity habit, it was learning something new, and for my love habit it was doing one kind thing for myself or somebody else each day and really tapping into that. Sometimes for my zest habit I’ll make sure I’m getting out and exercising or getting a walk in around the block at lunchtime or things like that, for example. [00:20:43] And then, most importantly, and this is where a lot of our habits go wrong when we try to build them, is to reward ourselves for having done it. So when we reward ourselves we give our brain that lovely charge of dopamine, our feel-good chemical, which means that next time that cue goes off we’re going to have a good memory of doing this habit so we want to go through that whole loop again. And we ran a challenge a couple of times a year at StrengthsChallenge.com, and we invite people all over the world to come in for free, create a little strength habit, and for a week we all try and do our habits, and we’d let each other know how we’re going. [00:21:14] And we found that the most common reward that people around the world use was their morning cup of coffee. [laughs] So they didn’t get their morning cup of coffee unless their habit was done. For me, mine was a bit sad, it was turning on my emails, but for me it’s like an itch I’ve got to scratch, opening those emails every day. And so I did not open my emails until I’d done my reading habit each day. [00:21:34] So whatever reward works for you, but I really encourage when you’re starting one of these Strengths habits, make the reward so attractive that you’ll do the habit just to get to the reward. So this is how we can create little strengths habits. And actually, Lisa, on our website, and we can put it in the show notes for people, we have a little free ebook that has 70 different strength habits for all the different strengths that people created all over the world for how you can use these. Lisa Cummings: [00:22:00] Oh, I love it so much. We’ll definitely put that in there. And hearing things like reward and how you use the email, it was totally relating to me because I was thinking, “The cues are brilliant. I’ve heard a lot about that. I do that in some cases. I forget to do that in others.” So just setting the intention to do that is a beautiful idea that we need to remember for habit. [00:22:21] And then, I know when I wake up I use my phone as an alarm clock, and the first thing I do while I am walking from the bed to the bathroom, as I get on, I check email or Twitter or something for 15 seconds, and that is so ridiculous. And that would be a great one, just like you mentioned with your email. It’s this weird itch. And maybe later that would feel not like a reward at all, but right now it’s such a drive in me that I know it would be powerful to have to do something else first. Michelle McQuaid: [00:22:49] Yeah, I think the reward is really important when you’re starting. I think you’re absolutely right. Over time, number one, of course, we adapt to the reward. But, number two, just as I was finding with my curiosity one, after a bit just using the strength becomes, it’s like reward, and that enough becomes compelling enough for us to get in there. [00:23:05] But I think when we’re starting out, because, again, we’re trying to wire our brains perhaps to do something in a way we haven’t quite been doing consistently before, I think having a really strong reward – and it sounds for you like that checking the Twitter and the emails would work – is absolutely imperative. And I think it’s a step we under-bake most of the times when we’re trying to create behavior change. Lisa Cummings: [00:23:25] Yes. And the other thing that I love is how you mentioned once you get started, a lot of times you feel yourself in the flow, you feel yourself in a zone of greatness. So I want to get on that topic for a minute as well because I’ve noticed, even personally, take one like zest where I like to be out and feeling alive and with physical energy. So it may be getting some exercise, it may be drumming because that’s a nice physical way that I feel excited. But sometimes I’ll feel that it’s a little bit of a luxury, and so if I have a busy day I might put it off until 9:00 p.m. when I’m tired. And so I would love to hear more about your work and study of the zone of greatness. Michelle McQuaid: [00:24:03] Yeah. So, again, I think we shouldn’t underestimate just how powerful, say, 10 minute of drumming is actually to the rest of your day because it’s not just that moment that you’re engaged in and in flow but it’s the ripple that it creates. And we know, for example, that when we’re in a more positive mood it broadens our brain, so we’re seeing more of what’s going on around us, our field of peripheral vision is increased to 75% generally versus 15% in a neutral or negative mood. We flood our brains with those feel-good chemicals of dopamine and serotonin which help us to be more creative, to do better off in our complex problem solving and analysis as well, and we think more about we; we’re more collaborative because our brains feels safe. [00:24:45] So, number one, I always say to people, “Even if your strengths development habit isn’t work-related don’t worry because that 10 minutes of getting yourself in that zone, neurologically you’re preparing your brain to be in a much better space to do work that you need to do. [00:25:42] So I want to hear from you, if you’re talking to a manager who’s exploring Appreciative Inquiry for the first time, how would you tell them to approach it? Michelle McQuaid: [00:25:51] Yeah. Well, when we talk about Appreciative Inquiry we simply explain that it’s a strength-based approach to creating change, be it in an individual, a team or a whole workplace. And what we’re doing is really trying to work, number one, with people’s brains rather than against them. So we’re trying to work with how people’s brains are wired to perform at their best, those neural pathways that spent time building. But we’re also trying to work with a team or an organization’s strengths by identifying the strategies, the cultures, the systems, the processes, the tools that are already in place and what’s working well there because they’re working well for good reasons. [00:26:27] And what we’ve seen in the research is by building on the things that are working well, organizations see a much quicker return on their investment of effort and energy than if we try to fix the things that are broken. The things that are weaknesses are weaknesses for really good reasons because we don’t have the strategy, culture, systems, processes to be able to support them. And this doesn’t mean, just like working with our own individual strengths, it has to be an either/or strengths or weaknesses focus, but perhaps what we’re seeing in the research is that it seems to serve us best if we can spend about 80% of our time focused on ways to build strengths in our workplaces and each other, and 20% of our time focused on fixing the weaknesses. [00:27:11] So if something’s a genuine risk, it’s exposing the business, it’s causing harm potentially, but by all means go with that head on. Don’t mess around. But if we’re really trying to get commitment from our people to change rather than just compliance where we’re going to have to keep motivating them with higher incentives of bonuses and promises of rewards or threats of punishment, then an Appreciative Inquiry strengths-based change approach is going to be far more effective in the long term. [00:27:39] So, again, I think Appreciative Inquiry is just another tool like any other tool we have. I think traditional problem solving, deficit management, a different tool, and it’s thinking about in different situations for different outcomes, “Which of these approaches is just going to serve me best?” And I find if we approach it like that with leaders, it kind of calms them down. It’s like, “Oh, okay. This doesn’t mean I can’t talk about what’s not working.” We absolutely can, but it does mean we’re going to be realistic about how we get the best return on investment, by building on the things that work for us already. Lisa Cummings: [00:28:10] What a beautiful way to pull this altogether. I love the idea that you said, you don’t want to just get compliance. If you want to get commitment this is a way through to that. And I say all the time, “Notice what works to get more of what works.” It’s so easy to repeat what you’ve already done really well. So being able to notice that is going to get you more of that. And we’ll all have mountains to climb, we’ll all have obstacles to overcome, and what you’re doing well as a team is a way to get over that mountain. Actually, what a call back. This is the perfect way to end right here. It’s the drop-the-mic tie-back to your Dr. Seuss book, Oh, the Places You’ll GoI because your mountain is waiting, so get on your way. Michelle McQuaid: [00:28:51] Exactly. Exactly. Lisa Cummings: [00:28:53] So, we’ll get on our way with the end of the show. Thank you, Michelle, for joining. This has been so enriching and practical at the same time. Deep. I loved every minute of it. The listeners are going to want to get your book. I know we will have so many resources that we’ve mentioned on the show. Also, for everyone listening, who’s hearing about Martin Seligman for the first time, I’ll put those books in the notes as well. [00:29:17] So, now, it’s up to you. You guys take at least one thing we talked about today and build your own strengths habit around it. So, thanks for listening to Lead Through Strengths. Remember, using your strengths makes you a stronger performer at work. If you’re always focused on fixing your weaknesses, you’re choosing the path of most resistance. So claim your talents, make it a habit, and share them with the world.